Just three more days to Christmas and I will need to bid adieu to you. Starting to feel a little funeral-ish rather than festive-ish. As you know, my two weeks long Guess-Share-Tag-WIN contest concluded six days ago. And now that the contest is over, it is time for me to write all about my first and possibly only contest. Yes. The Grinch aka Batwoman aka mummy says, "Too much work, Flapper! If you want to run another contest, you are doing it yourself next time!" Once upon a time, I went to The Barkery Singapore for some baking lessons. I learnt how to bake those yummilicious Gingerbread Cookies. Remember I left part 3 and said "Shhhh... More to be revealed soon"? Part 3 is all about the contest. How the contest idea came about was quite silly, really. After our failed attempt to decorate those gingerbread cookies, mummy decided to see how many of those cute cookies she could stack on me. Yep! My mummy can be quite the bo-liao (nothing-else-better-to-do) but because I love her, I will entertain her silly ideas. 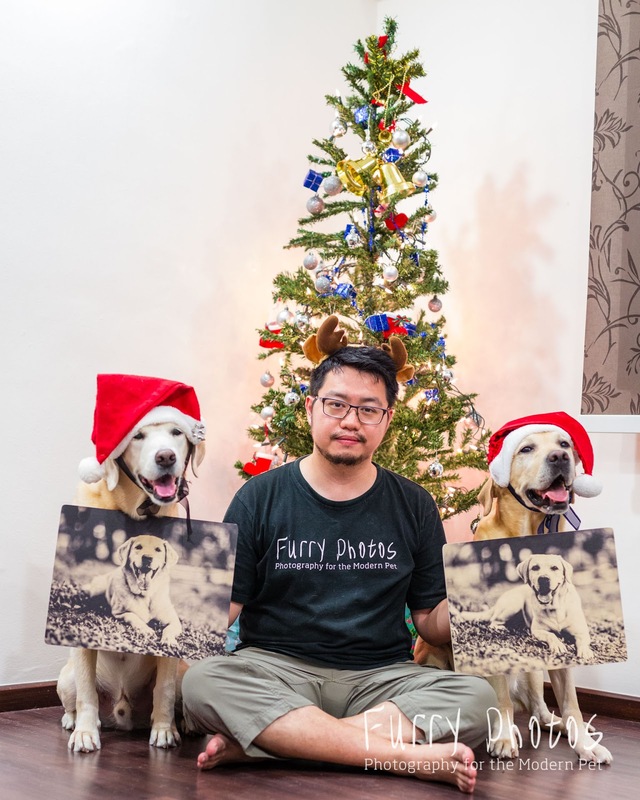 While editing my 'X'mas Special at Barkery' series of videos, Uncle Nic sent me the photos that he took. I saw this photo and the light bulb above my rocket scientist head lit up. This photo was the inspiration behind my Guess-Share-Tag-WIN contest. "Mum! Mum! I think we should run a contest with this photo! Let's put a big question mark to block the cookies and have people guess how many cookies I stacked! ", I exclaimed excitedly. "Flapper... you want to run a contest? You trying to kill me ah? ", mummy said. "Kill you, no. Run a contest, yes! ", I smirked at mummy. "Okay Flapper. If you say so....", mummy conceded in resignation. It started out as a simple and fun idea... really. In my blonde mind, I visualized the contest to be really simple and fun. Just have people guess how many cookies I stacked in total and the first correct entry wins the prize. 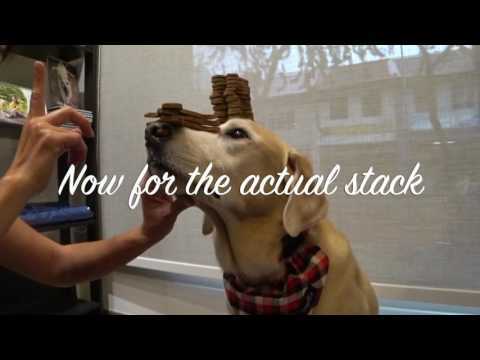 Since this stacking thing was done at The Barkery and the photo was taken by Uncle Nic, I immediately asked both Auntie Ann and Uncle Nic if they would like to sponsor the prizes. I planned to keep it that simple, like very simple. Then another light bulb lit up. I looked at mummy with THAT look... THAT smirk... and said most cautiously, "Muuummm.... don't you think it will be a great idea if we can get all my sponsors and collaborators together for the contest? You know how you always tell me that my sponsors should be with me through my life moments? 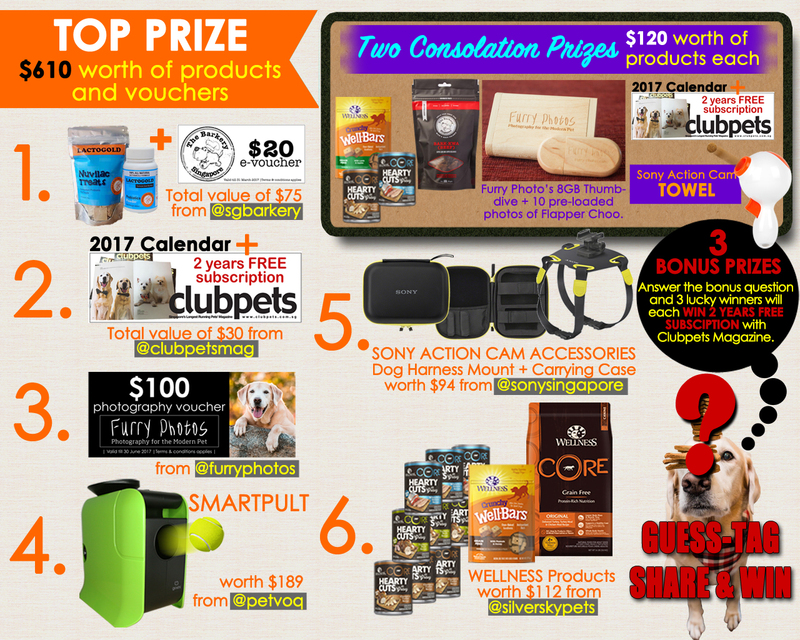 How great will it be if we can bless another doggie with prizes that represent my life?" She glared at me hard. "Flapper-Ah-Choo... you are not serious, are you? ALL your sponsors and collaborators? You sure???? ", mummy retorted. I knew she got my drift. I promptly got to work and pitched the idea to all of my sponsors and collaborators. The only thing that could really happen was... they said no. Nothing to lose. Really. Not like I get paid for running this contest! Lo and behold, Christmas Fairy! I received overwhelming response of participation from the sponsors! Woohoo! Of course, that meant from that simple idea, it became a tad bit more complicated. Not one nor two sponsors... SIX sponsors. Oh boy... What did I get myself into?!?!?! I obediently sat down to work out the mechanics of the contest. With all six sponsors participating, I had to make sure I had a solid plan on how to track the entries. I also had to make sure it did not look like some bogus contest. To the contest drawing board, I went. I had an idea about what prizes I would love from each sponsor but pitching it to them was another thing all together. I did not want to come across as I was only mooching products out of them but yet at the same time, I wanted to make sure that whatever prizes that was offered, represented my collaborations well and most of all, it was something that could benefit the prize winner. From putting the prizes together to the "How To" of the contest, what started out as a simple and fun idea became a tad bit more complicated but when I started to see the prizes the sponsors were offering, I gasped and exclaimed,"O.M.G. mum! This contest is turning out to be very very exciting.... the top prize is sitting at a some $600 worth of products and vouchers." That was when I realized... the contest had become real. Very real. What started out as a simple fun idea... became very real [and serious] when all six sponsors replied affirmative to sponsoring the prizes. And all that Social Media mechanics! For those who knows Batwoman will know that she is not a tremendous fan of social media. As she always says,"My Facebook account is kept alive to maintain Flapper's account... and like seriously, every time I think I have learnt the new damn features, blardee Facebook (and Instagram) would have a new update and I'm back to square one! Damn it!" There were many occasions where mummy considered deleting off my Facebook page as she was getting absolutely pissed off by the algorithm changes. But sentimentality of having maintained my account for four years and counting, she cannot bear to do it. So imagine this... running a contest means Batwoman needs to figure out all that social media mechanics! Can you see the invisible fire blasting out from above her head? I would feign ignorance and snore in my comfy birthday bed as she struggles to work out the contest and social media mechanics. I have long mastered the art of pulling my infamous emo face while mummy's beady eyes threw daggers at me. We wanted to be able to validate the entries... not fair to those who gave the right answer and abided by the contest rules. One thing you MUST know about Mummy and me, we will fulfil our commitments to the best of our abilities and more than anything, we want it to be fair. We will not tolerate cries of foul play because even though no one's watching but we will make sure we executed the contest honestly and ethically. We even decided that we will video our prize picking process to show that the prize winners were not picked in favour of anyone in particular. And you know what was the biggest learning lesson from running this contest, Christmas Fairy? Learning how to work freakin' Facebook Page and Instagram... and all that rubbish with boost post. There were many moments Batwoman wanted to delete my Facebook Page account but she gritted her teeth as she struggled through freakin' Facebbok hiccups and was busy every single day of two weeks trying to figure out "what's next?" and "how ah?". Mummy always says... "If I had known 4 years ago that running a Facebook Page would become so complicated, I would have just set up a normal Facebook account for Flapper." After days of working on the contest mechanics and artworks, I was finally ready to launch the contest on 1st December 2016... 08:00 hours. I woke up especially early that morning to test the page out to make sure there were no glitches. Murphy's laws... the form was having display problem on mobile devices such that it was not displaying in its entirety. I broke out in cold sweat as I tried to figure out those icky HTML codes on how to get the forms to display correctly. I was still struggling to get the form to work at 8 am and was racing against time. I was certainly late in launching the contest and Batwoman had to leave home for work at 8:40 am. I thought I may not be able to launch the contest as planned. Finally at around 8:30 am, after a whole lot of trial and errors, by some stroke of miracle the mobile and desktop display worked. Phew! A little late with the contest launch but better late than never. Running the contest for full two weeks felt like eternity. Watching the entries slowly crawling in was fun... but somewhat nerve-wrecking. No denying I was hoping the contest will be a hit so it was disheartening when the response was underwhelming. But still, the contest had to go on. Running this contest was not just about blind promotions for the sponsors but it was also the perfect opportunity to show how much each of them means in my life. So I readily accepted the proposition of giving a shout-out to each and every sponsor mid-week through the contest. As I always say, there's a reason for my well-rounded selection of collaborations. It isn't about "lelong lelong... free I take". Even though prior to this I have done individual reviews for the products, my mid-contest posts for the sponsors gave me the chance to just talk a little about the collaborations and why each of them are important to me. Yes. It was a lot of work. Conjuring different artworks which I ended up changing ALL the artworks eventually. Let's just call it last minute inspiration! Like many pawrent, mummy got the jitters 7-8 years ago when she first made that big decision to put me on Wellness Core. She fell in love with its wholesome, protein-focused and balanced diet with the added goodness of supplements such as glucosamine and probiotics. 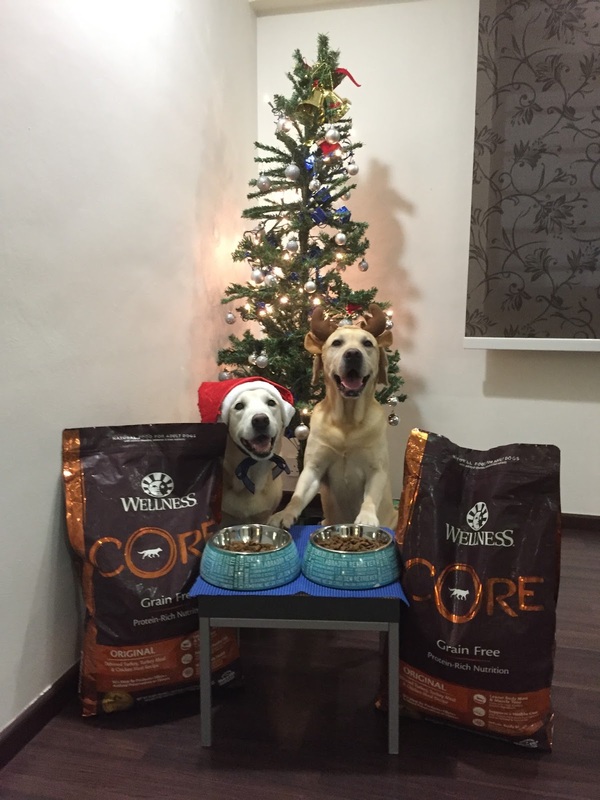 So erm yeah, 7-8 years later I am still on Wellness thus not only did I rejoice when @silverskypets finally decided to sponsor both Frodo and I in August this year but also decided to gift some other lucky doggies with Wellness products for my fun Guess-Tag-Share-Win contest. 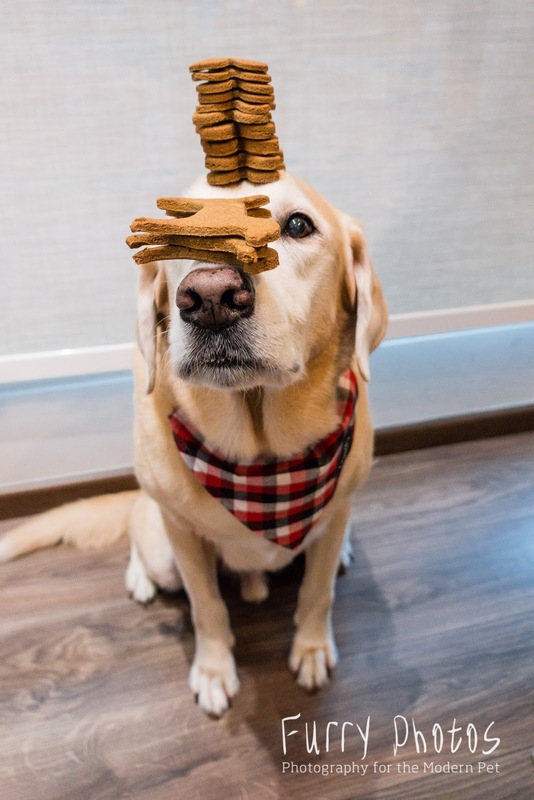 . . To stand a chance to win one of the fab prizes, all you need to do is - SHARE this or any of the contest post, TAG 2 friends, #FlapperSponsorsGive and go to WWW.FLAPPERTHEDOG.COM to submit your answer/Guess how many cookies I stacked! . . Many thanks once again to @silverskypets for being one of the contest sponsors. You can also feel free to Direct Message (DM) them direct for a sample pack of food to try! It has been fun lately collaborating with @clubpetsmag and it all began with their grand 50th issue in Dec 2014 where I was featured my brother-whom-I-miss-very-much, @romeotan. Two years later and for their soon-to-be-released issue #62, they are featuring my fabulous grand 10th birthday story! And yes! 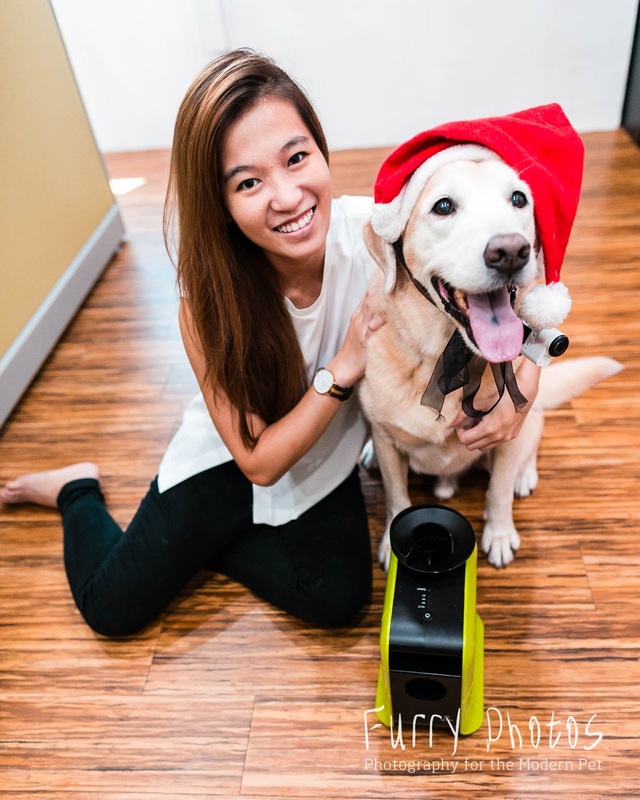 I will be there at @avasingapore "Happy Pets Happy Hood" tomorrow, 11th Dec 2016 from 6 to 6:30 pm at Waterway Point. 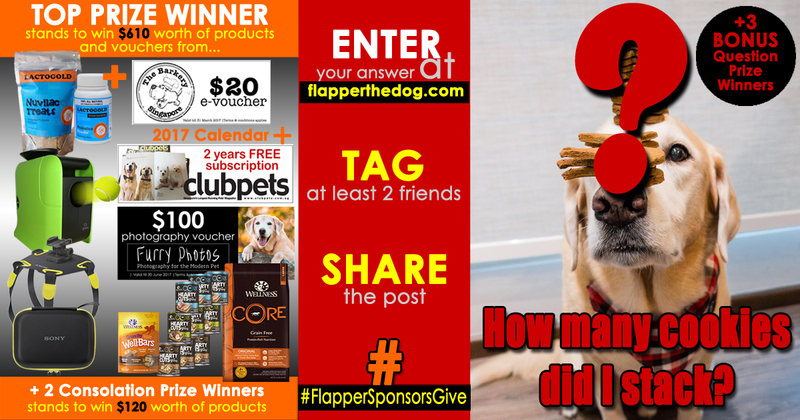 . . Don't forget my 'Guess-Tag-Share-Win' contest is still running and @clubpetsmag is generously giving away 2 years free subscription for each prize winner simply by sharing this or any of the contest post, tag two of your friends, #FlapperSponsorsGive and finally, guessing how many cookies in total I stacked at www.flapperthedog.com! . . In the meantime... have a fantabulous Saturday everyone! Wherefore art thou the prizes? In a blink of my blonde eye-lashes and squared-eyes from all that artworks, it was close to the contest finale. I still have not received all the prizes. And truth be told I was so focussed on the artworks for the contest, I did not do a stock check either! So imagine my surprise when I realised I was missing a consolation prize... here and there. My first stop was Petvoq's office. DID YOU KNOW... that was my first visit ever to their office? It is always super fun to visit the sponsor's office! Not only do I get loads of attention and treats... yes, I need to work a little too.... but always nice to get to know the wonderful people behind the names I represent. And best part of this office visit? I get to play with my favourite toy called the SmartPult between work! All work and no play makes Flapper a dull boy. Surely soon enough... after Christmas perhaps... I would get that video edited. HAHA! My next stop was Sony Singapore's office to collect the forgotten consolation prizes then to The Barkery. I have to say big big thanks to Silversky Pets. They were super efficient in sending the prizes down to me. And Uncle Nic too..... for running around town to collect prizes with me and taking such fabulous photos for keepsake. I was knackered by the time I got home. But curiosity of seeing all the prizes got the better of me. You see, mentally, I knew how the prizes look together as I pieced the artworks together. But nothing like seeing it 'live' as a reminder of the purpose of this contest. The long awaited moment finally arrived. After closing the contest on 15th Dec at 23:59 hours, it was finally time to select the winners. Of course, Santa Flapper me had to select the winners! As you can see from the video, I said a prayer before selecting the winners. I prayed that the winners will benefit from the gifts and make good use of it. I did wonder whether about the prize winners... but fate is as fate is. I picked the winners by lucky draw so surely they were meant to win the prizes. After emailing the winners to notify of their win and congratulate them, I arranged to meet up with them for prize delivery on 21st December 2016. Mummy initially planned to do the delivery without me as she was not sure if the smallies would be naughty or nice. But after exchanging couple of emails with the nice mummies of the winners, mummy felt assured as they were honest about their pooches. Winners Fun Fact #1: As it turned out, I had met Pom Pom and her mummy quite recently at Clubpets Magazine aka Citrus Media office when I went for my birthday getaway interview! Winners Fun Fact #2: Mafia's mummy knows Uncle Nic and Auntie Daphne! So when mummy found out how much they wanted to win the prizes for different reasons per prize, we were so so happy that the top prize winner was indeed a worthy winner! I was so so happy and felt touched as it brought new meaning to the contest. This contest turned out to be quite a roller-coaster ride. My first time ever hosting a contest and boy... was there so much to learn. I am still suffering from contest hangover. Although the contest ran for two weeks but the actual count was four weeks of non-stop work. Never in my wildest imagination did I ever think I would run a social media contest! Mummy did warn me of the amount of work involved but at my insistence, the contest happened. At this point I am quite a 'Hero' or am I 'Stallone'? This Christmas Giveaway contest would not have been possible without the spontaneous participation of all my sponsors and collaborators. The very kind and lovely ladies of Barkery who are always there for my furmily and I for our life events! 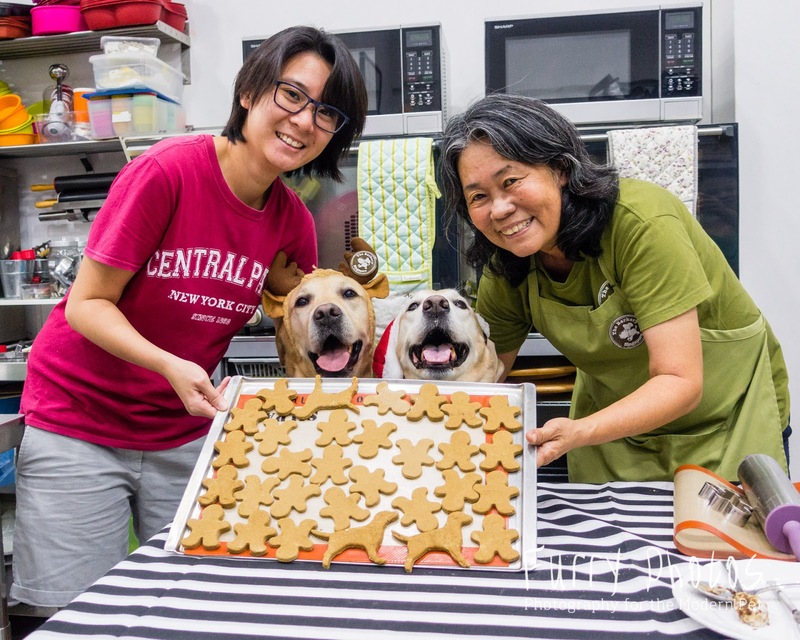 Barkery Singapore - Thank you for the baking lesson and those Gingerbread Cookies which was the inspiration behind the contest. As always, thank you for spontaneously agreeing to sponsoring the prizes without hesitation.... and always being their for my furmily and my life moments. Clubpets Magazine - The fabulous recent collaborations - from my 10th Birthday feature for Issue #62 to mummy's wedding on Bliss magazine issue #61 to those special appearances ... these little collaboration moments added so much more value and meaning to my Christmas journey this year. Our stunning wooden-print x'mas present from Uncle Nic! Furry Photos Pet Photography - No words can redeem the amount of help Uncle Nic has rendered through this #FlapperLifeMoments journey and ALWAYS being there for me. Uncle Nic has captured so many wonderful photos of my life journey since 2013. He is not only an awesome pet photographer who has a way of working with animals... but he is such a precious friend and sleep buddy. Petvoq - What can I say.... that SmartPult aka Ball-Launcher! Thank you so so much for agreeing to sponsor the SmartPult and Treat-and-Dash toys without any hesitation. It has been so wonderful getting to know you guys, especially Ms Maye, and having me at your office! I love having Christmas Tails Tales to tell. 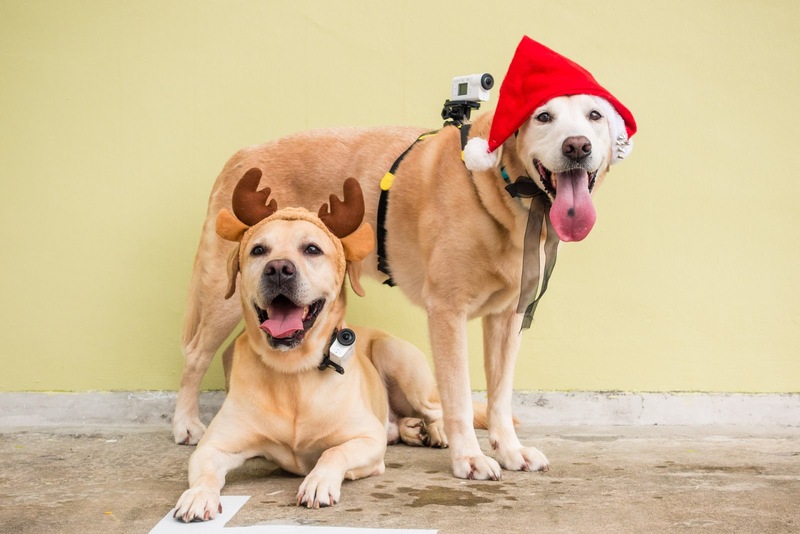 Sony Singapore - For choosing me, Flapper Choo, once again to run the Sony Action Cam campaign. Thank you for listening to our suggestions and allowing me to document #FlapperLifeMoments, which has brought so much meaning to my Christmas this year... and believe it or not, my FIRST Christmas tree ever in my 10 years young of life! Because I have received the Sony Action Cam, I have been able to video the journey of this contest. This is my first and only actual Christmas ever so THANK YOU! You made festive grinch (mummy) pull her hair and grow more frown lines on her face running 'Countdown to Christmas' but you made festive reveler (daddy) very very very happy. 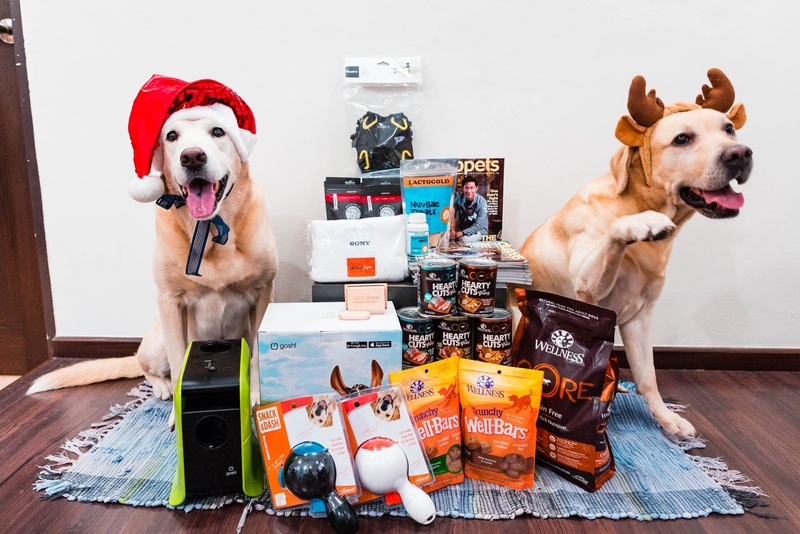 Silversky Petcare - Christmas came early that day in August when you said 'yes' to sponsor Frodo and me on our long-time food, Wellness Pet Food. Thank you for your generous sponsorship for the contest... and all that little perks and extras you send our way. It's been really wonderful collaborating with Silversky thus far and here's to #Wellness10 to come! And that's it from me Christmas Fairy! I think I will be talking to you one more time to before bidding adieu to you (and my HDR-AS300).